Powers Gold Label is a complex spice and honeyed taste experience. Every drop is triple distilled, with more cut from the top and tail of the second and third Pot Still charges. This means only the purest heart of the distillate is captured. This is then left to mature in select American oak casks which allow the distillate driven style to shine. 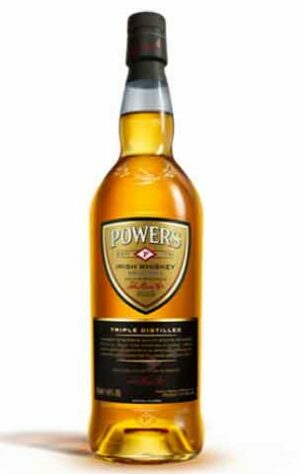 Powers Gold Label is blended with the finest grain whiskey, also exclusively matured in American oak casks. 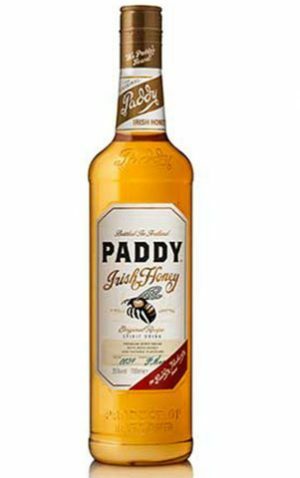 Finally, a Powers production technique enables a non-chill filtration at 43.2% abv quite unique amongst Irish whiskey. 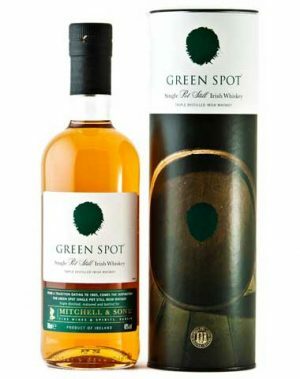 The Green Spot name originated from the Mitchell family’s practice of marking casks of different ages with a daub of coloured paint. Originally there was a ‘Blue Spot’, ‘Red Spot’ and even a ‘Yellow Spot’, but Green Spot emerged as their most popular whiskey and is one of the few “whiskey bonder brands” to survive to modern day. Made from a mash of malted and unmalted barley and then triple distilled in traditional copper pot stills, Pot Still whiskeys are characterised by full, complex flavours and a wonderful, creamy mouth feel. 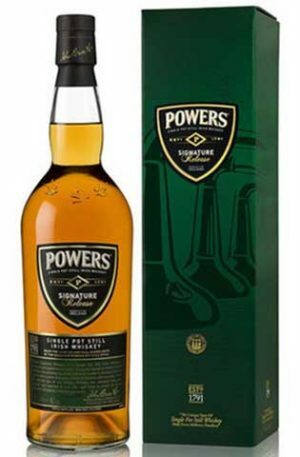 Powers Signature Release is a Single Pot Still Irish whiskey of outstanding complexity and flavor. Matured mainly in American oak barrels with a subtle inclusion of first fill Oloroso Sherry casks. Under the watchful eye of the Master Blender, the whiskeys have been selected and married at just the right time to create an overall character of balance, intensity and depth. 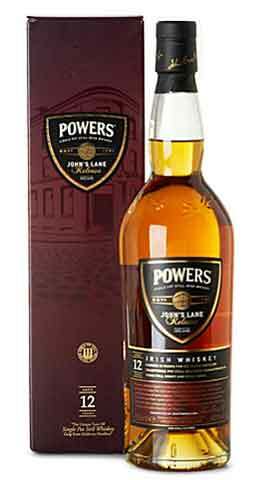 James Power founded his distillery at Thomas St. in 1791 moving shortly thereafter to a larger site at John’s Lane near the western gate of Dublin. It was at John’s Lane that the Powers whiskey legend originated and gave rise to one of the most quintessentially, Irish whiskeys. A single pot still release matured in a combination of bourbon and Oloroso Sherry casks. The newest addition to the Redbreast family, Redbreast Sherry Finish Lustau Edition offers a new way to experience their signature sherry taste. 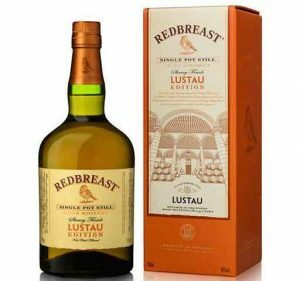 Born of a unique collaboration between the Bodegas Lustau and the Midleton Distillery, Redbreast Sherry Finish Lustau Edition is initially matured in traditional bourbon and sherry casks for a period of 9-12 years. It is then finished for 1 additional year in first fill hand selected sherry butts that have been seasoned with the finest Oloroso sherry from the prestigious Bodegas Lustau in Jerez. A special edition whiskey, Green Spot Château Léoville Barton. 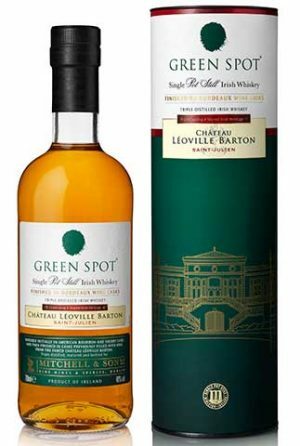 Initially matured in traditional sherry and bourbon casks, Green Spot Château Léoville Barton was then finished in French oak wine casks, adding an exciting new dimension to this Single Pot Still Irish Whiskey already renowned for its excellent quality. Now a permanent expression in the family having originally launched as a limited edition, Redbreast 15 Year Old is matured in a combination of Spanish Oloroso sherry casks and American Bourbon whisky barrels. 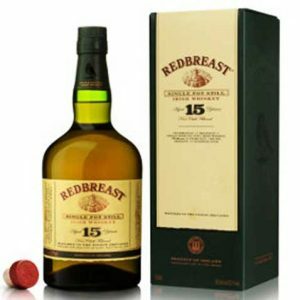 Bottled at the higher ABV strength of 46%, Redbreast 15 Year Old is non chill filtered. Yellow Spot Whiskey originated in the late 1800s, it was made at Jameson and placed into a variety of empty barrels provided by the Mitchells then aged back at the Mitchell cellars. Now distilled at the Midelton Distillery. 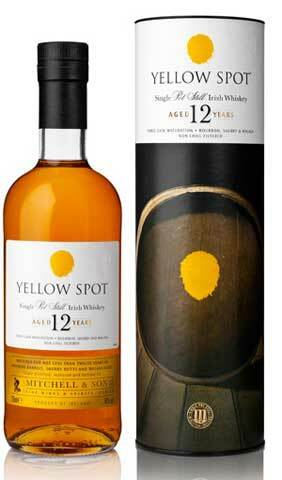 Yellow Spot 12 years old, is single pot still whiskey and aged in a combination of American bourbon, Spanish sherry, and Spanish Malaga casks. The flagship blend from Ireland's biggest distillery was created in 1984, and released annually since then. It really is rare as only a limited release of about 50 casks are released every year. This renowned whiskey is a bottling of hand selected whiskeys, between 12 and 25 years of age, from the Midleton Distillery (home of Jameson) and represents some of the finest distillates produced at this famous location. The master distiller, Barry Crockett, only chooses whiskey matured in seasoned American oak casks for the annual bottling, and as a guarantee of the unique quality of this rare whiskey, Barry applies his signature to each individual bottle. Due to the hand crafted nature of Midleton Very Rare, there are slight variances in taste from year to year. The wood makes a huge contribution to the aroma, but in many guises. On the approach there is the light delicate scent of rose water which, on closer inspection, develops into a rich vanilla and honey sweetness. This goes to compliment a succulent body of baked apples, melon and a touch of dried fruit. A fine hint of charred oak, and subtle Pot Still spices, give the aroma wonderful balance. The initial sip has a very satisfying mouth coating effect. The sweet vanilla notes line the tongue before the crispness of the Pot Still spices, black pepper, cinnamon and cloves combined with green apples and unripe pears, all contribute to the complexity of flavour. In the finish, as the flavours subside, there is an exquisitely mellow reminder of the charred American Oak cask used in the many years of maturation. 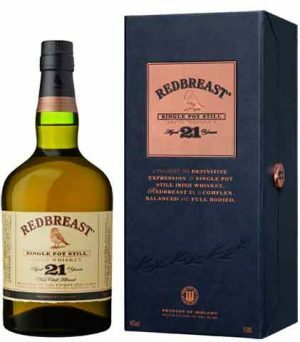 Redbreast 21 year old is the finest representation of the signature Redbreast sherry style. It is the oldest and richest expression of the Redbreast style ever produced, and the 21 year ageing process introduces new levels of depth, flavour and taste to create an inherently complex and ultimately, rewarding whiskey. "Funky, lemon and white equatorial fruits on the nose. Toffee, coconut, burnt sugar. Wonderfully untidy. Full of character. A fruity animal of a nose. Nice sweet and hot finish. Has a very tropical feel to it. Enormous character. Really good and capable of getting even better." 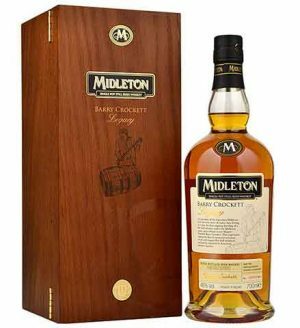 Bearing the name of the celebrated second generation Midleton Master Distiller, Midleton 'Barry Crockett' Legacy represents a selection of pot still whiskeys which have been matured exclusively in American bourbon barrels with a subtle contribution from a pot still distillate which has matured in an unseasoned American barrel. This whiskey is bottled at 46% abv and is presented in a stunning wooden box which contains a tasting note and whiskey information booklet There is only a very limited release of around 2,500 bottles worldwide per year. "The sweet coppery and malty nose bolstered by dark sweet notes… awesome. The sweet dessert and rich malty character sitting side by side on the palate with some complex fruit… awesome. 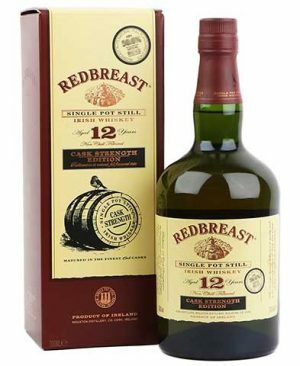 The sweet fruity and woody finish… awesome"
Redbreast is a 12-year-old, single aged pure pot-stilled whiskey that's been triple distilled in traditional copper pot stills from malted and unmalted barley mashes. It might be the finest Irish whiskey available. Picked up the top prize in its category at the World Whisky Awards 2010, and was named as Irish Whiskey of the year by Jim Murray in the Whisky Bible 2010, with a score of 96 points. 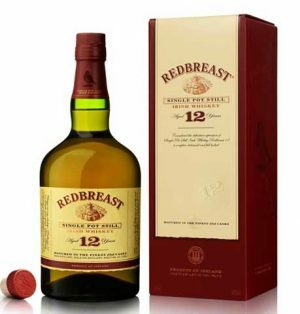 Full of aroma and flavour, Redbreast 12 Year Old benefits from a strong contribution from distillates which have matured in Oloroso sherry casks, giving it its trademark Christmas cake character. 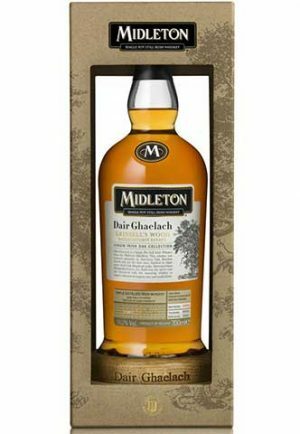 Midleton Dair Ghaelach is the latest addition to Single Pot Still Whiskeys in the Midleton range. This uniquely Irish whiskey was triple-distilled, blended from a mash of malted and unmalted barley then matured primarily in refill American Oak bourbon barrels, and for the first time ever, finished in virgin native Irish Oak Hogshead casks, harvested from 130 year old oak trees from Grinsell’s Wood, within the Ballaghtobin Estate in Co. Kilkenny. 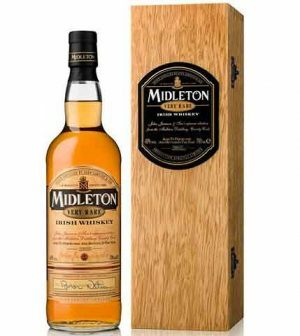 Midleton Dair Ghaelach (which means “Irish oak” in Gaelic) is crafted in the classic Single Pot Still Irish Whiskey style, a mash of malted and unmalted barley has been triple distilled in traditional copper pot stills and matured for between 15 and 22 years in American refill casks. Uniquely, the whiskeys were then married together for two days and filled into Irish oak casks for almost a year. According to Billy Leighton, Midleton Distillery’s Master Blender, “The process of maturing in native Irish oak has enabled us to showcase our Single Pot Still Irish Whiskey style in a new and innovative way, the casks impart much more generous toasted wood, vanilla and caramel flavors than what we expect from American bourbon"
This bottle contains whiskey from batch 01, that was matured in wood from tree number 3 and bottled at cask strength 57.9% abv, non chill-filtered. 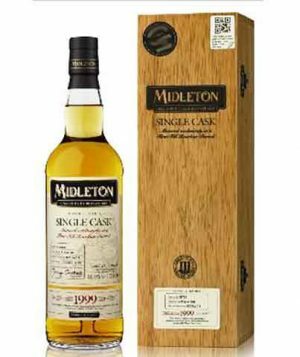 Single cask single pot still Irish whiskey from the Midleton distillery, matured in ex-bourbon casks, true to the Midleton style, which have been charred and seasoned with bourbon. Filled in June 1999, bottled at 55.6% abv without any chill-filtration, resulting in a fragrant but intense flavour profile, 228 bottles produced. Each expression is presented in a premium bottle, following the same design cues as Midleton Very Rare, the most exclusive whiskey produced at The Midleton Distillery.